MapCreator software combines cartography and graphics functionality to enable the user to create both static and animated maps of the highest quality, as often required for presentations. 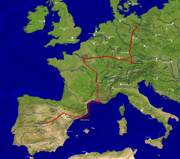 For example, maps may be needed for a travel presentation. But also in other cases, where a map is needed, to present the essential information in a professional manner, MapCreator is the right choice. 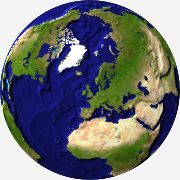 Convince yourself about MapCreator by looking at some sample maps and animations on the right side of this page. Or test MapCreator Free Edition. 1. Only essential information should be shown. The map should support the presentation, not deflect attention from it. 2. 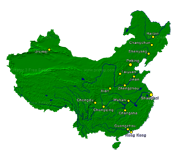 The map should be of high graphic representation quality, it should look professional. 3. The customer must have the right to publish the map. MapCreator has been designed to fulfil these requirements. MapCreator does not contain a map collection, but a map generator. Map collections present a problem in that usually none of the maps included exactly fits your requirements. 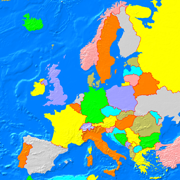 One or several of the map properties (map extract, map size, map type, bodies of water, borders, colours, visible towns, size and type of labelling …) are not quite as you envisage. In MapCreator on the other hand, the maps are generated from the integrated geo-database. All map properties can be adjusted independently of each other. 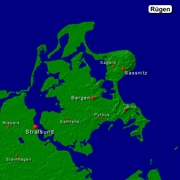 Maps generated can, as customary in traditional graphics programmes, be edited further. Map objects (towns, labels, symbols, pictures and routes) can be added, changed or removed. The size, position, colour, style, transparency and various 3D effects of the map objects can be edited. Much importance was attached to making the drawing in of visually attractive routes very easy. GPS files can be imported and displayed as a route. Individual countries can be highlighted or isolated. Data available in table form can be imported. 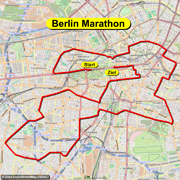 The map created can be saved in the usual picture formats (TIF, BMP, JPG, PNG, …). 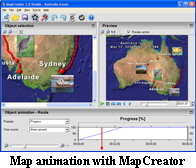 Various animations can be produced from the maps created. This could be e.g. 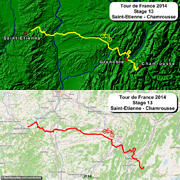 a progressing route, the fading in and out of map objects or a flight over a larger map. The time course is here freely adjustable. The animations can be saved in Video(AVI)-format, for integration in a video film and in Flash(SWF)-format for the representation of an animation on an Internet page. The size and frame rate of the video/Flash film is freely adjustable. Videos of the standard sizes PAL, NTSC and HD can be produced, but any other size can also be set. Maps and map animations created with MapCreator can be used in presentations without further enquiries. You can find out more about this under Map licenses. 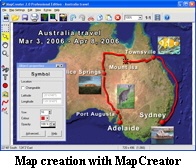 The operation of MapCreator is kept very easy, it is geared to the operation of picture editing programmes. Users with experience of picture editing programmes will find their way around easily in MapCreator. Map size and map extract are freely adjustable. 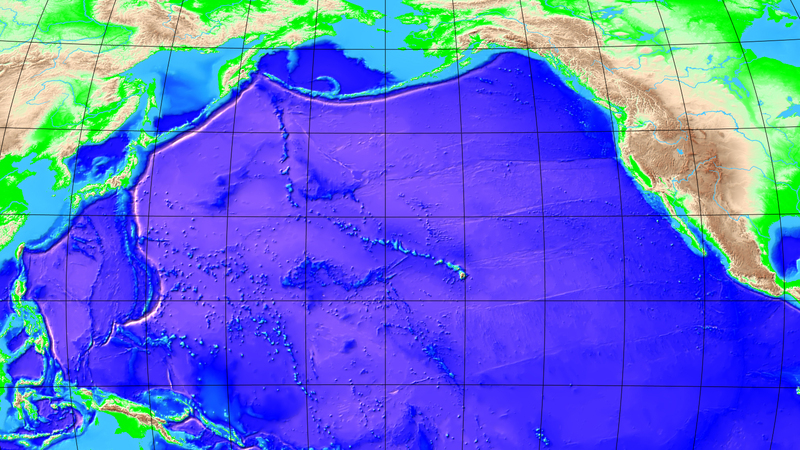 Land and sea can be represented in single colours, given a colour profile according to terrain height and sea depth, as a satellite photo or as vegetation. Land and sea can be shown in relief, the characteristics of which can be adjusted. Inland waters can be inserted in varying numbers. The representation given is of a very high graphic quality. The edges of these inland waters are drawn in very softly, width of rivers increases with their course. When adding towns, the population size from which a town is visible can be fixed. For each town size the town symbol and the town labelling can be freely adjusted. Borders can be shown in any colour, width and transparency desired. A graticule with varying possibilities for setting can be drawn in. 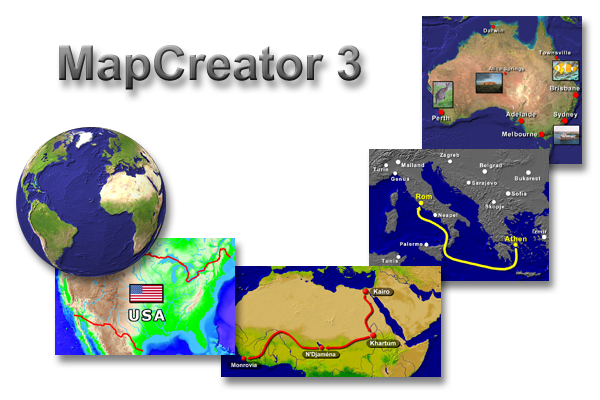 MapCreator is available in the three editions Free, Personal and Professional. Regarding function, these editions do not differ. Maps created with the Free Edition contain a watermark. The Professional Edition is required for commercial use.